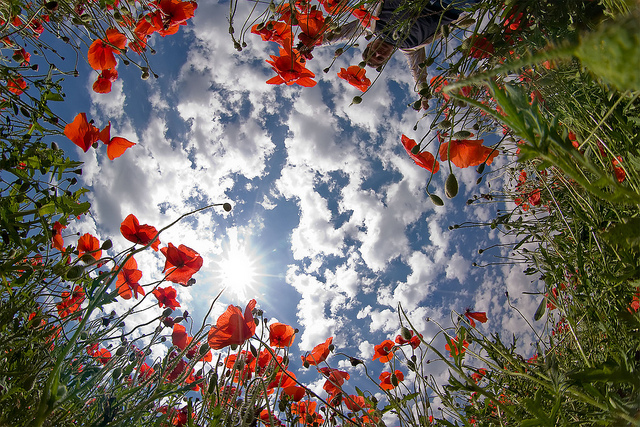 Spring is in the air, and I’m feeling a little guilty. I feel like we Minnesotans got away with something this past winter. In terms of snowfall, the East Coast — specifically Boston — was hit harder and more often than a Brad Radke fastball. Every time I turned on the TV, it seemed there was another report of those poor suckers out east shoveling themselves out from under a fresh pile of snow. Meanwhile, here in the Great North, where the white stuff is supposed to fall all the time, we had barely enough accumulation to build a proper snowman. Of course, we had our share of frigid temps and frigid-er wind chills, but all things considered, the 2014-15 winter in Minnesota was a rather mild affair. And while that surprise snowfall a couple weeks back made us all a bit nervous, spring’s warmer temps appear to have put this year’s version of Ole’ Man Winter to bed before the ageless codger was able to muster much of a fight. 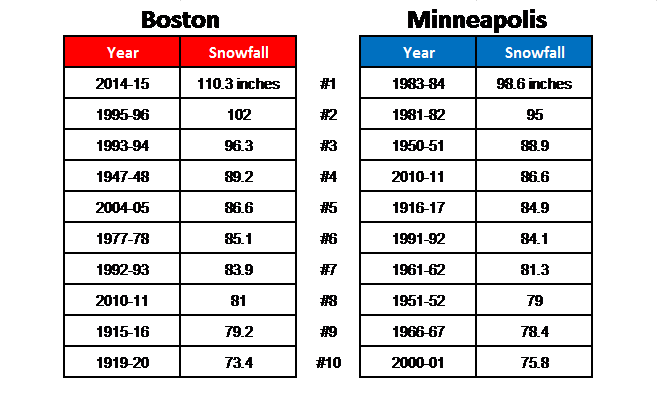 Now that spring has sprung in earnest, Boston’s recent perpetual blizzards juxtaposed with Minnesota’s relative snowless-ness this past winter got me thinking: How do the snowiest historical winters in each of these two metro areas compare? And how do we stack up against the rest of the country? 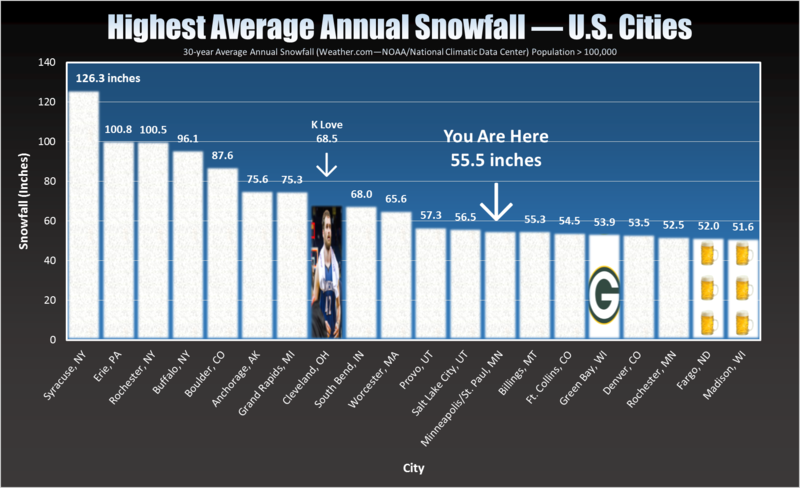 Which cites in the U.S. get the most snow per year on average? Huh…I didn’t expect that. Boston has out-snowed us at nearly every spot on the list. But that’s just a list full of outliers, right? Let’s take a look at average annual snowfall across the whole country over the last 30 years — where do we rank among U.S. cities? According to the data, Minneapolis/St. Paul (55.5 inches per year) isn’t even in the top ten of America’s snowiest metro areas with populations above 100,000 — and Boston (43.8 inches) doesn’t make the chart at all. Meanwhile, Syracuse more than doubles the Twin Cities’ annual snow output, leading all large cities in the U.S. with an average of 126.3 inches of snow per year. I had no idea it snowed that much in Syracuse. • Native Californian and former T-wolf Kevin Love escaped Minnesota’s cold only to find himself in a statistically snowier Cleveland (68.5 inches). Cleveland is also currently home to a statistically superior basketball team who many consider the favorite to win this year’s NBA Championship. So, enduring a bit more snow might end up earning KLove a ring. God I’m glad winter is over.